Today we will learn about shaper machine parts and its working. It is commonly used to produce flat surface, grooves, slots etc. The work piece is hold by a adjustable tool post in shaper machine. A single point cutting tool is in reciprocating motion rub the work piece and cut unwanted metal from it in form of chips. It consist many important parts which take care of it proper working. These are ram, table, clapper box, tool head, column, cross Rail, stroke Adjustment, table supports, base etc. 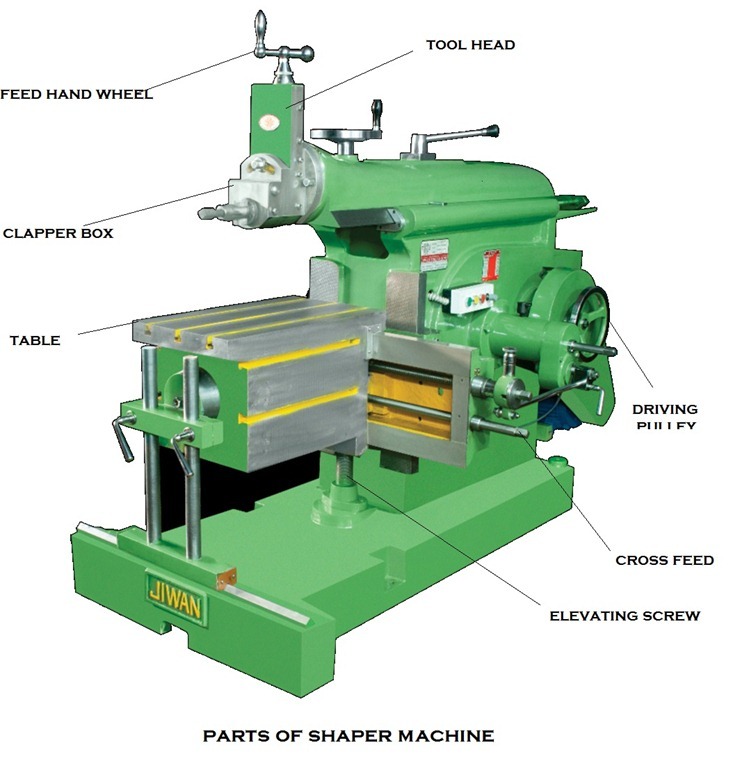 Shaper machine works on the quick return single crank mechanism which provides the tool reciprocating motion. It is the main body of the machine. It consist all element of machine. It works as pillar for other parts. Base is made by cast iron which can take all compressive loads. It is the main part of the shaper machine. 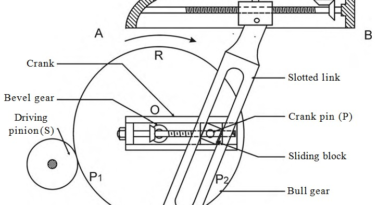 It holds the tool and provides the reciprocating motion to it. It is made by cast iron and move over ways on column. It is attached by the rocker arm which provide it motion in crank driven machine and if the machine is hydraulic driven it is attached by hydraulic housing. It is situated at the front of the ram. Its main function is to hold the cutting tool. The tool can be adjusted on it by some of clamps. It is the metal body attached over the frame. Its main function is to hold the work piece and vice over it. It has two T slots which used to clamp vice and work piece over it. It carries the tool holder. The main function of clapper box is to provide clearance for tool in return stock. It prevents the cutting edge dragging the work piece while return stock and prevent tool wear. Column is attached to the base. It provides the housing for the crank slider mechanism. The slide ways are attached upper section of column which provide path for ram motion. It consist vertical and horizontal table sideways which allow the motion of table. It is attach with some cross movement mechanism. It is attached below the table. It is used to control the stroke length which further controls the ram movement. These are attached front side of the table and used to support the weight of table during working. Shaper machine works on the quick return mechanism. It is used to shape the metal or make flat surfaces, making grooves and slots. It cuts the metal in one stroke in back motion or in froth motion and the remaining one is useless. The working of shaper machine can be described as follow. First the job is fixed to the machine table. The single point cutting tool is mounted on the tool post situated on the ram. Now the motor start by manually which create reciprocating motion of ram by quick return mechanism. When the ram is in reciprocating motion, the tool rubs the work piece, which removes unwanted material from it. It cuts the metal in forward stroke. While return strokes the clapper provide the clearance between tool and work piece, which make sure no cutting in return stroke. If the tool cuts material in both in forward and return stroke it give poor surface finish and also cause for tool wear. Today we have discussed about shaper machine parts and working. If you have any query regarding this article ask by commenting. If you like this article, don’t forget to share it on social networks. Subscribe our website for more informative articles. Thanks for reading it. Which motor is used in Shaper machine? ?